A Public Notice Board Features Self-Healing Cork to Last for Years! 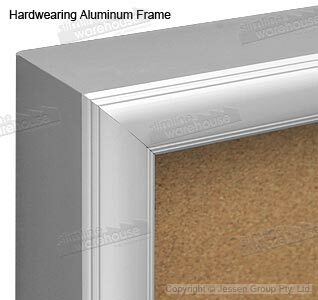 This public notice board is made from anodised aluminium, providing a hard-wearing display that is durable enough for use in heavily-trafficked areas for years to come. A silver finish provides a professional look that is able to be used within any décor. 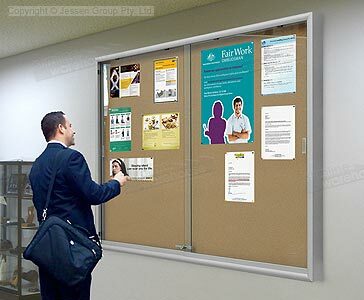 The pinboards are commonly found in lunchrooms, community centres, city transit stations, information centres, exhibition halls, universities, and more. 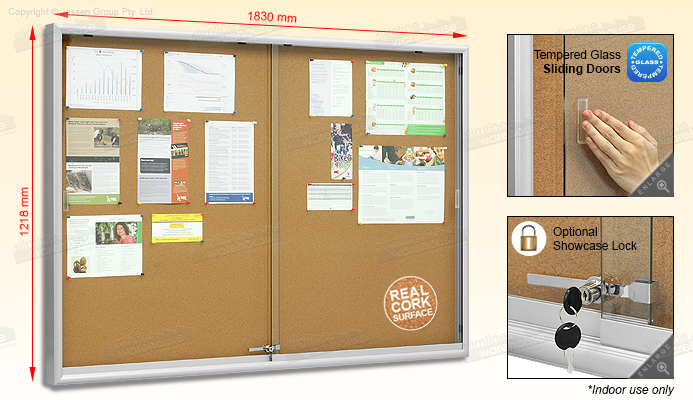 This noticeboard, public notice board features a self-healing corkboard that is accepting of staples, pins, and tacks. This makes it easy to put up your posters quickly! Many locations use these displays to show timetables, announce upcoming sales and events, and even show menus for passersby to peruse to help entice them to enter your establishment. These pinboards are a lockable display allowing you place the unit in any location without worry of the case contents being tampered with. The showcase lock makes it easy for and your employees to access the interior of the cabinet to take down old poster and put up new announcements! This display noticeboard has sliding glass doors that help keep the interior contents free of gathering grime or dust whilst on display. The tempered glass doors are shatter-resistant, and have a handle attached onto the panel to make opening and closing the doors easy without placing unsightly marks on the panels. Installation of this display is easy using the included hardware kit. Z-bars are used to hang the cabinet onto your wall, and the hardware should work well with most wall surface types, though if unsure please consult with a professional prior to installation. Order one of these quality pinboards today to show your notices to visitors in style! Noticeboards include many different fabric, cork, & combination options to choose from that makes it easy to put around your business to help show important information to passersby in a stylish manner. The various styles we currently offer make it easy to find the right size & type for your place. Display on your walls to place notices for passersby to see. The extensive online catalogue has hundreds of items available in many different categories, helping you to choose products to outfit your business with exactly what you need to fulfill your needs. We add items to purchase weekly in order to provide our customers with the latest trends, styles, & technologies. From pull up banners, iPad displays, brochure holders noticeboards, A-boards, & hanging hardware to cafe banners, photo frames, hanging hardware, cigarette bins, poster stands, & POS signs! With over 20 years in the business, Slimline Warehouse has tried and tested products from vendors around the world to offer our customers the best quality products at prices that can't be found anywhere else online! Same day despatch is provided from our warehouse with most in stock products, as long as products are purchased by 1pm EST! Order for your company today from anywhere in Australia, including Sydney, Canberra, Hobart, Bendigo, Adelaide, Perth, Melbourne, Cairns, Gold Coast, Brisbane, & so many more! For our range of outdoor notice boards, click here.